For many, heading to Cape Horn, the southern-most tip of South America, is a bucket list dream. Cape Horn is an isolated island in the southernmost point of the Tierra del Fuego archipelago. But the logistics and distances to get there are staggering. 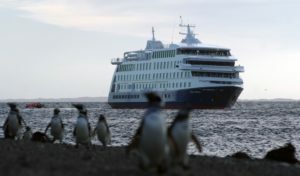 That’s why an adventure cruise is the perfect choice to travel comfortably to Cape Horn. Aboard a small ship, you’ll witness incredible fjords, massive glaciers and waterfalls in intimate groups with experienced guides. The most popular choice is to first fly Buenos Aires, Argentina where you can enjoy a few days in this vibrant city. Fly next to Ushuaia, the gateway to Antarctica for many ships. 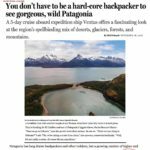 Board a 5-day, 4-night cruise aboard a luxury ship like the Stella Australis or Ventus Australis from Ushuaia to Punta Arenas, Chile. These ships carry a maximum of just 210 guests in 100 cabins, with daily guided excursions off the ship in small groups of 16 or less. A must stop is Magdalena Island, which lies about halfway between Tierra del Fuego and the Chilean mainland. The distinctive lighthouse was once an essential source of supplies for navigators and explorers. The island is inhabited by an immense colony of Magellanic penguins. Cruising is the only way to truly see the most of the majestic Chilean side of Patagonia. The Ushuaia to Punta Arenas itinerary route is the better choice for travelers who are particularly interested in the region’s spectacular wildlife such as elephant seals, beavers, and the lively Patagonia penguins. Since these ships are the only ones who stop at several different remote sites, they can guarantee exclusive access to landing spots as you head to shore by small zodiacs – no wet landings, just dry landings on piers and ramps. No matter your physical capability, anyone can disembark the ships and go for a guided hike. Going by ship also guarantees you the most up close and personal experiences to wildlife and landscapes like you’ve never seen before. The national parks, glaciers and fjords you’ll visit are among the most beautiful in Patagonia and can not be reached by car or by foot. While you are enjoying your cruise, the staff on board are also working hard to help protect the fragile eco-system. Often the team leaders and naturalist guides are actively participating in scientific research headed by universities and conservation groups, providing in-the-field and up-to-date data and sightings. Ultimately this type of nature expedition cruise appeals to the wanderer in your soul. Each day you can step into some of the most remote landscapes in the world, but return to a luxury experience on board with fabulous food and an upscale cabin with panoramic windows.